Philadelphia 76ers guard Landry Shamet (23) drives to the basket against Brooklyn Nets forward Joe Harris (12) in the first quarter at Barclays Center. The Sixers came out looking terrible against the Brooklyn Nets, trailed by double digits for most of the game, and probably deserved to head home as losers. But just like their football counterparts on Sunday, they managed to pull a rabbit out of their hats in the second half, with a Jimmy Butler game-winner earning them a 127-125 win out of nowhere. Here's the quick version of what I saw in Sunday evening's game. • We saw a lineup wrinkle from Brett Brown early in Brooklyn, and one that I think the Sixers should turn to more. Rather than going to Amir Johnson off the bench after subbing out Joel Embiid, Brown brought in T.J. McConnell and Landry Shamet, turning over the keys at center to... Ben Simmons? It did not go all that well at the defensive end, with the Nets scoring a bunch inside. But I like the motivation behind playing this group against a Brooklyn team that spreads you out and attacks with multiple ball-handlers at a time. The Sixers are going to need to build wrinkles like this into their rotation to counter teams down the road, so they might as well start testing them out now. • There aren't a lot of positives to speak of when the Nets are comfortably out in front for the majority of the game. However, it was good to see Embiid continue to take it Brooklyn's front line all game, mostly abandoning outside shots in search of contact in the paint. He has to walk a near-perfect line despite being the team's best player because of the roster around him. If he doesn't step out and make teams respect him from deep, the lanes are closed for Simmons, and Philadelphia's roads to offensive success begin to close. Embiid also can't abandon that work in the paint, though, lest he gets away from what he does best. The big man only took eight shots the last time these two teams got together, and he was not going to be a passenger in this one. • The only thing that should give Sixers fans comfort about the Zhaire Smith fiasco this season is Landry Shamet, who is offering legitimate contributions from the bench in year one. If they're getting value from the guy they took late in the first, they probably deserve a little time to show the athletic freak they traded for was worth the risk of trading away a ready-made contributor in Mikal Bridges. If not for Shamet's third-quarter outburst, this one might have been a laugher by the time the fourth quarter rolled around. • I just want to make note of the fact that Butler had a tremendous offensive game here, before setting you up for one of my primary complaints about the game/gameplan below. And after noting the guards had to help out on the glass after the loss to Cleveland, Butler delivered all by himself on Sunday. • Full disclosure that I wrote that bullet point before Butler hit the game-winning shot in Brooklyn. He gets another one, because that shot was absolutely ridiculous. That's why they went out and got that man. • Philadelphia continues to get lit up by guards this season, with D'Angelo Russell joining the club on Sunday evening to the surprise of almost no one. I think we've reached the point where we have to stop considering this a coincidence, and the Sixers probably need to consider making some changes to who takes on different assignments. Guarding the opponent's top guard has been Jimmy Butler's assignment so far, but I think Ben Simmons might need to get a crack at this. Brown used Robert Covington in this role previously and probably wants to leave things unchanged for the players still here post-trade, but it seems like a better fit for both guys. Simmons' shaky habits off-ball are minimized, and Butler can spend more time on wings, where he's traditionally had a lot more success. This isn't a one-size fits all deal, but there should be a real conversation about who gets different assignments each night. That's not how it looks to be at the moment. • Speaking of Butler's use, I continue to be perplexed at how Brown is deciding to integrate him into the team. Which is to say, I have no idea why you would trade for an All-Star wing who is known for his ability to create with the ball in his hands and not turn him loose. I get that he needs time to settle, and I get that the Sixers' offense is wildly different than anything Butler has played in at the pro level. But you don't need to do anything complicated here — let him run some pick-and-rolls, let him run the offense if Simmons is on the bench, and in general, just let him do his thing. If not, why bother making the deal in the first place? 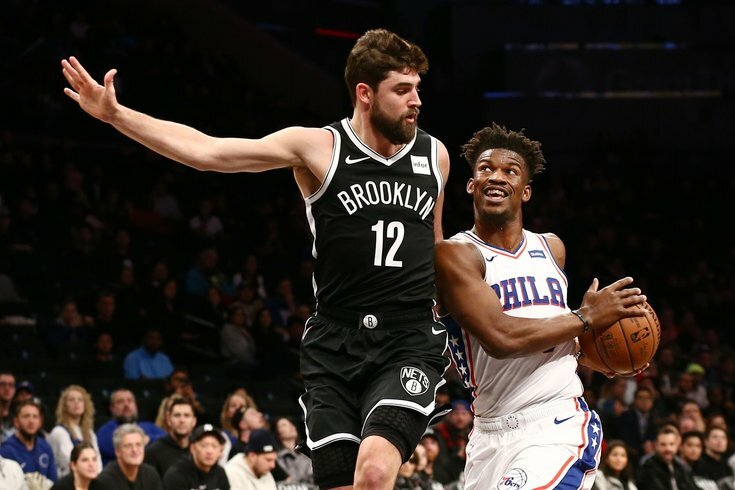 Once the Sixers started letting him impact the game in the second half, Butler proved more than capable of taking things over and putting the Nets on their heels. Let the man loose. It probably wouldn't come down to a game-winner if you did. • I'm not a huge Furkan Korkmaz guy because of the defensive warts he brings to the table, but the Sixers could make much better use of him on offense if they just, you know, actually looked for him when he moves off the ball. Embiid in particular just completely ignored him on a couple nice cuts, and he's the guy who can benefit the most from smart movement away from the ball. Everyone likes to complain when the big man has stagnation around him, but he has to actually recognize good movement when it tilts in his favor. • I don't know what the Sixers think they're accomplishing with their pick-and-roll coverage this year, but it has flat-out sucked for long stretches of the season. They have their bigs (in many cases, Embiid) dropping so far on the screen that they're not gaining any benefit from doing it. It's one thing to drop back and concede long two-point jumpers. What the Sixers are doing is basically allowing guards to get to the paint, and then forcing Embiid to commit or concede an open shot from close range. When he's committing, the guards are often just looking for quick hits to the vacated big man, and when he doesn't, most NBA guards can make lightly-contested shots from the free-throw line and in. Look at some of the better performances from guards this year against Philly — Devin Booker, Kemba Walker, and Russell on Sunday — and the constant is the scheme. The Sixers want to keep Embiid closer to the rim, but they're not gaining benefits from attempting to do so and are probably making their problems worse with the scheme tweaks they've made. You want to know why the Sixers have been so bad on the road? Their defense hasn't been good. And when you let NBA-caliber players get going early by playing soft, crappy defense, you should not be stunned when the chickens come home to roost in the second half. If you play pickup-level defense in the first half, this is what happens. • I noted this after the Cavs game, but I think soon we may have to talk about the overall roster construction and the pressure that is put on role players to shoulder the three-point load. You don't need elite shooting from every big-name player you have, but when the balance is so skewed by the presence of someone like Simmons (and to a lesser extent, a post-up big) you really have to nail the moves and players around them. Spoiler alert: the Sixers have not done that so far. So when JJ Redick goes ice cold from three, you're in big effing trouble due to simple math. Threes are worth more than twos, my dudes. As an additional note: the space conceded to Simmons is only growing. He is going to have to start taking shots, regardless of the result. • Speaking of Simmons, the Sixers created a turnover midway through the third with the lead cut down to nine points, and instead of trying to continue building momentum, he threw a home-run pass down the floor to a streaking Redick. He basically got stuck under the rim, and ended up turning the ball over trying to hook up with T.J. McConnell. You have to know your personnel there, and I don't care if Simmons is capable of making the pass, it's an unnecessary risk with the game tilting in your favor. Make the easy plays. • Watching the Sixers play against teams with guards who can score — which is to say, almost all of them — really brings into focus how dire they are on that front. The Sixers don't have a single three-level threat amongst their guards, despite spending two No. 1 picks on guys they call point guards.